You must assemble the major components of this engine to make what you see in the photo to the right. Building on the very popular ZZ502/502 Base engine kit, GM Performance Parts offers you the Deluxe version of that same engine combination. The Deluxe ZZ502/502 kit gives you the opportunity to get all the parts you need in one box to build your own high performance big-block Chevy. By offering you a tested combination of parts, GM Performance Parts has taken all of the frustration out of putting your own engine together—no mismatched parts that don’t work together. When assembled and installed, you get a Rat motor that cranks out 502 horsepower (one horsepower per cubic inch) and 567 lb.-ft. of torque. 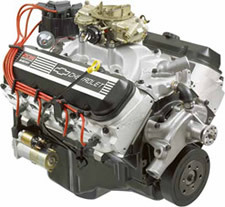 For the ZZ502/502 Deluxe kit, GMPP took the ZZ502/502 Base engine kit and added to it a Holley 850-cfm four-barrel carburetor, starter, distributor, plug wires, and water pump. Together, they add up to a GMPP-tested and validated 502 horsepower and a stunning 567 lb.-ft. of torque at the crack of the throttle. Imagine the satisfaction that you’ll feel when you fire it up for the first time. This is a kit and comes in pieces. 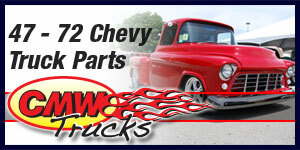 You must install heads, valve covers, intake, carburetor, water pump, distributor etc.